Bachelor of Arts, Anthropology, State University of New York, Albany, 1992. Although I have loved being in the woods all of my life, it wasn’t until I took a really good silviculture class in 1994 that I realized that I had a passion for forestry. Since then, my major interest has been understanding the point of intersection between responsible resource management and the ecology of natural systems. 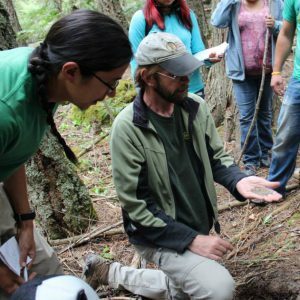 I have been a Forestry adviser and instructor at Salish Kootenai College since 2003, and had the privilege to be the lead instructor in designing the Bachelor of Science program in Forestry at SKC in 2005 (which is still the only Bachelors Degree in Forestry at a Tribal Colldge). In the last few years, I have also been co-adviser of the Forestry and Natural Resources Student Club. Off Campus, I am currently co-chair of the Intertribal Timber Council Research Sub-Committee and a member of the 3rd Indian Forest Management Assessment Team (IFMAT III), a once every 10 year, Congressionally mandated review of forestry in Indian country. I have also had the opportunity to prepare the curriculum and conduct week long forestry skills Woods Work courses to tribal woods crews on reservations in Oregon, Nevada, Alaska and Minnesota. When I am not chasing after my 5-year-old daughter, Sofia, I also like to bake bread and hang out with trees, which are much cooler than you might think.